Visually build and deploy streaming and batch processing use cases rapidly, with best-of-breed open-source technologies, both on-premise and in the cloud. 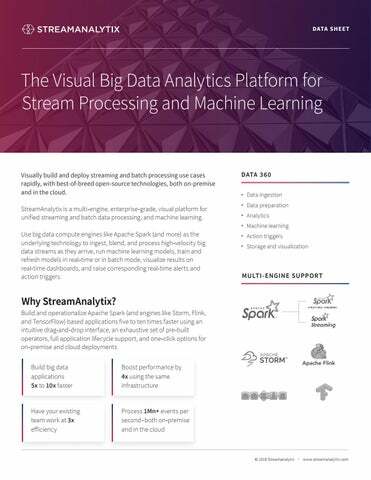 StreamAnalytix is a multi-engine, enterprise-grade, visual platform for unified streaming and batch data processing, and machine learning. Use big data compute engines like Apache Spark (and more) as the underlying technology to ingest, blend, and process high-velocity big data streams as they arrive, run machine learning models, train and refresh models in real-time or in batch mode, visualize results on real-time dashboards, and raise corresponding real-time alerts and action triggers. Ingest and blend data at scale from any data source–batch or streaming. With built-in support for Spark structured streaming, StreamAnalytix enables continuous applications by exposing a single API to write streaming as well as batch queries. Use models trained and refreshed in batch workflows to make predictions on real-time data pipelines. Click + code Use an exhaustive set of pre-integrated drag-and-drop operators in an intuitive visual interface. Or introduce custom logic in the language of your choice (Java, Scala, or Python). End-to-end data processing An end-to-end big data processing platform, StreamAnalytix supports data ingestion, data preparation and processing, analytics, machine learning, action triggers, data visualization, and data storage. Data ingestion: Connect with any data source or storage system for both streaming and batch use cases on-demand. Use pre-built connectors or create your own using custom API. Ingest and output popular data formats like JSON, CSV, AVRO, and Parquet, or easily build your parsers for custom data formats. Data preparation and processing: Perform data cleansing, data blending, and data enrichment at scale–on data as it arrives. Experience significantly faster processing with Spark-based structured streaming as the underlying technology. Analytics: Apply built-in analytical operators for complex event processing, time window aggregation, geospatial analytics, correlation, and more. 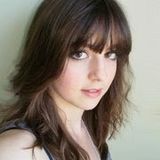 Data science and machine learning: Use advanced analytics and machine learning operators at scale like Spark MLlib and ML, model-porting standards like PMML, H2O, and TensorFlow or easily prototype your custom algorithm. Train and refresh models in both batch mode and on real-time data. Apply A/B testing and use ‘Champion Challenger, Hot Swap’ paradigms to swap the best performing model. Actions and alerts: Set thresholds for key metrics and corresponding real-time alerts and action triggers. Data visualization: Use inbuilt or custom real-time dashboards to display the status of metrics and key performance indicators for a pipeline. Blend real-time and historical data with oﬀline analytics and integrate everything you must keep track of, however disparate, onto a single screen. Application lifecycle management Build applications end-to-end with support for the entire application delivery lifecycle; design, build, test, debug, deploy, monitor, and manage. Rapid application development: Rapidly build and operationalize applications using a powerful visual pipeline designer, and a drag-anddrop interface. Interactive pipeline designing: Create schema automatically within pre-built operators. Data can be accessed from a data storage system, or configured from a source such as Kafka, JDBC and more and is automatically examined and assigned for each field and column. Debug: Trace and debug messages at each step, from entry to exit, during both the development phase of your pipelines as well as during production. One-click deployment – on-premise or in the cloud: Use one-click deployment options to deploy applications on-premise or on a public cloud. Application diagnostic tools: Allows auto ‘Data Inspect’ before and after the use of every individual operator, for an end-to-end view of data transformation at every step. And use ‘Data Lineage’ for your production-deployed pipelines. Versioning: Create and save new versions of your data pipelines. Roll back changes conveniently by reverting to an older version. Performance monitoring: Run streaming and batch pipelines regularly and consistently once they are in production. Get all performance metrics in real-time, through interactive graphs. Workflow orchestration: Enable integration of multiple pipelines to work in sync, and support parallel stitching for logic evaluation before it is put in production. Work with the power and flexibility of best-of-breed open source technologies integrated into a high-performance, scalable, and reliable enterprise-grade platform. Multi-engine support Leverage big data compute engine Apache Spark and other engines including Apache Storm, Apache Flink, Tensorflow and Oozie. Use multiple engines in a single pipeline; build and interconnect application sub-systems that each leverage the best suited engine with a consistent user experience. Built-in extensibility With the extensions API exposed by the platform, you can write your functionality in the language of your choice (Java, Scala, SQL, and Python), and make it available for all users across the platform. Self-service Use pre-built templates for frequently used application patterns and customize them to your needs. Easily access support and tutorials at every step. Strong ecosystem integration Compatible and integrated with leading big data technologies and platforms such as all key Hadoop distributions (Map R, Hortonworks, Cloudera), cloud platforms (AWS, Microsoft Azure), and key third party partnerships. Click here to download StreamAnalytix Lite for Free. StreamAnalytix Architecture StreamAnalytix integrates various key big data technologies, including support for multiple big data compute engines, a powerful array of pre-built connectors and operators to multiple systems, and functional extensibility for future readiness.